Grace United Methodist Church started in 1892, when a resolution was passed by the Illinois Conference of the Grace United Evangelical Church to establish a Mission in Dixon, Illinois. 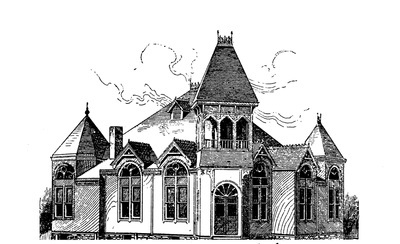 the original church was built on the corner of Ottawa and Fellow Streets and dedicated on January 7, 1894. ​ Grace conned to grow and the need for a new larger church became evident. Grace decided to relocate the church building from the corn of Ottawa and Fellow Street to East Chamberlin Street. Fund raising began in 1947, including the buying of bricks and tiles for the new building. Land was purchased and groundbreaking took place on August 19, 1956. The new church at 921 W. Chamberlin was dedicated on March 30, 1958. After the new church was built, Grace grew rapidly and steadily. In 1968, the Evangelical United Brethren merged with the Methodist Church and Grace Evangelical United Brethren became Grace United Methodist Church. Grace United Methodist Church has served its members in Dixon faithfully and participated in the life of the community for 110 years. From its beginnings as a Mission in 1892 to the present as a United Methodist church congregation, through growth and change, we remember our past, celebrate the present and affirm our future, confident that we labor nit in vain when we are in missilry for the kingdom of God in this place. ​ We believe that Grace United Methodist Church will continue serving, reaching out, witnessing, and proclaiming good news of Gospels not only in Dixon but also in the world. Because it is God's call to each of us. There are lots of people out there thirsting for God's Word and love. We will be God's hands and feet to spread God's Word and love. We believe you are also a part of our mission them. Let us work together to glorify our loving God!